Dubai: Olympic silver medallist P V Sindhu avenged her heart-breaking loss at the Rio Games to two-time World Champion Carolina Marin with a thrilling straight-game victory in a do-or-die women's singles Group B contest and sealed her place at the semifinals of the BWF World Super Series Finals on Friday. In a much-anticipated contest, Sindhu came up trumps against the Olympic champion Marin, who had spoiled her gold medal dream at Rio in August. The Indian dished out an energetic performance to see off a fighting Marin 21-17 21-13 in a hard-fought battle that lasted 46 minutes. A former World No 1 Marin, who held a 5-2 head to head record, tried to play an aggressive fast-paced game and pumped herself with each point, letting out a war cry but Sindhu was equally up for the battle of nerves and she showed tremendous grit and nerves to emerge victories in a crucial contest. With this win, Sindhu finished in the second place behind China's Sun Yu, who won all the three matches, in Group B. Both the players started with an aggressive rally and even though Sindhu had a 2-0 lead early on, Marin soon turned the tables at 4-3 when the Indian hit long. The Spaniard made it 7-3 with Sindhu playing a few nervous strokes. However, Sindhu changed her approach and got hold of her nerves and reeled off five points to lead 8-7. But again two long shots from Sindhu and Marin was 9-8 up. 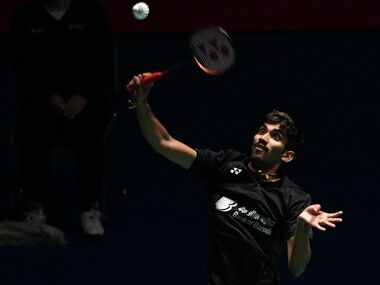 The left-handed Marin soon came up with a sharp smash which an outstretched Sindhu could not connect. But the Indian immediately produced three straight points and entered the break with a slender 11-10 lead after producing a superb cross court smash which found Marin napping. A lucky net chord helped Sindhu to lead 13-12 after the break which she swelled to 16-12 with Marin finding the net and hitting long. The duo continued to battle hard and engaged in some fast paced rallies with each trying to outdo the other with sharp acute angled strokes. Eventually Sindhu grabbed six game point advantage when Marin missed the baseline. The Spaniard saved three points before the Indian sealed the game with a superb smash. Marin needed medical treatment for what seemed like a bruise in her feet before the start of the second game. The Spaniard used her deceptive returns to put Sindhu in trouble and opened up a 3-1 lead which the Indian soon erased and grabbed a 5-3 advantage after another excruciating rally. Sindhu tried to keep her opponent away from the net and kept tossing the shuttle at the back of the court. The ploy seemed to work as Marin committed errors while trying to use deception to break the rhythm. Sindhu was equally athletic on court as she stretched, jumped and dived all across to cover the court and entered the interval with an 11-6 lead after Marin sent the shuttle wide twice. At 13-7, Sindhu missed the sidelines and coach Pullela Gopichand tried to calm her down. With Marin continuing to struggle with her strokes, Sindhu soon lead 17-10 and eventually grabbed a 21-13 match point advantage when Marin hit long after another exciting rally. The Indian then sealed the match as the Spaniard found the net again.